Coconut oil has of late, garnered a lot of attention among men, and for good reason. There are tons of benefits of coconut oil for beards. Millions of people have woken up to its benefits. Drug and cosmetic companies are also using it as the base for natural medicine, nutrition and beauty products. So is the hype true? Can men benefit from the use of coconut oil for beard growth? Does coconut oil really increase facial hair growth? Let us try to answer these questions. 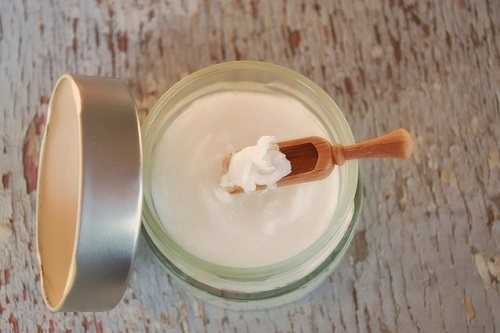 Why is Coconut Oil So Beneficial for Hair and Skin? Coconut oil is composed of healthy fats. It has lauric acid which has immune strengthening properties which can ward off common infections like colds, skin issues etc. Internal use of coconut oil helps strengthen the heart and aids in weight management. Likewise, its topical use can benefit hair and skin and enhance beauty. Regular use of coconut oil is proven to make hair shinier and skin softer, smoother and wrinkle-free. In many Asian countries, coconut oil is used as a cooking medium as well as for regular skin and hair massages. It is no wonder that such men and women along the coasts who eat traditional native diets tend to have shinier, longer hair and beautiful, supple skin. Regular bathing with harsh soaps and body washes strips our skin of friendly bacteria and natural oils making it tight and dry. Adding a good moisturizer can help reduce this tightness and if the said moisturizer has good quality medium chain fatty acids, like those present in coconut oil, the results can be better. This wonderful oil can take care of cuts, wounds, scrapes, and burns on the skin. Coconut oil reduces streptococcus and staphylococcus bacteria and prevents infections. If you are troubled with skin infections or wish to avoid them, you might benefit from the use of coconut oil post shaving and showering. 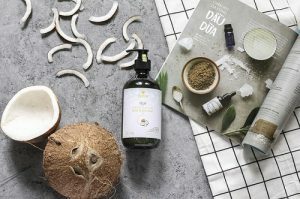 Being naturally antifungal and antibacterial, coconut oil beard oil recipes can prevent ringworm, scabies, dandruff, eczema, psoriasis, acne and other common skin infections. It also acts as an exfoliant to remove dead skin cells. For acne sufferers, coconut oil breaks down into medium chain fatty acids on the skin to curb the bacteria which cause acne. With regular use, you can also prevent blemishes and reduce deep discolorations caused by environmental factors as well as acne scars. 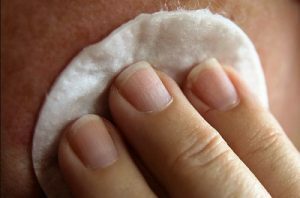 It can also help prevent wrinkles, warts, skin tags, and speed up healing of shaving nicks and cuts as well as wounds, scrapes, and burns. What coconut oil does for the skin, it also does for the hair. If you are concerned about having a patchy beard, you might want to start using coconut oil daily. Coconut oil for patchy beards balances the ph of the hair and skin and conditions beard hair. It acts as a natural protective barrier against harsh environmental toxins, pollutants etc. The antifungal properties of coconut oil prevent dandruff and lubricate and soften the skin to prevent itchiness, flaking etc. Since the oil is easily absorbed into the skin, it protects against the effects of DHT (the hormone responsible for hair loss or alopecia) and stimulates the hair follicles. This gives rise to luxurious hair growth. Note that you need to use coconut oil for beard growth diligently to see positive results. There are multiple ways in which you can use coconut oil for beard growth. 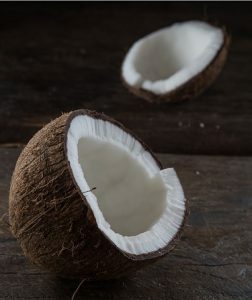 As stated above, coconut oil imparts wonderful health benefits for hair and skin and when you use it internally, you can enhance your overall well being. Take a tablespoon of organic, virgin coconut oil daily. You can add it to your morning coffee or use it as a salad dressing. Also use it in your baking, sautéing and stir-fry recipes. If you aren’t too fond of the taste of coconut oil, you can choose light coconut oil which is practically odorless and tasteless. Oil pulling is best done first thing in the morning, on an empty stomach. Take a tablespoon of extra virgin coconut oil in your mouth. Do not swallow. Start swishing the oil around your teeth. You need to swish for at least 20 minutes. In the beginning, the oil will be heavy and viscous which makes it difficult to swish. After a while though, it gets easier as the saliva mixes with it. Spit out the oil after 20 minutes. Do not swallow as it contains toxins. Do this regularly to detoxify the body and improve overall health. Using a comb, divide the beard into sections. This will help you distribute the oil evenly. Warm up a bit of coconut oil in a double broiler. You may add a few drops of your favorite essential oils to it. Coconut oil is a great carrier oil and enhances the medicinal properties of essential oils. (There are many beard oil recipes discussed on this site). Mix the oils well. Using a sterile cotton wool, apply the blend all over the beard sections. Make sure you reach the roots of the hairs. Massage well for 5-7 minutes. Soak a clean towel in hot water and wring out the excess water. Wrap the towel around the beard. Leave it on for 30 minutes (or overnight if you like). The hot steam enables the oil to penetrate deep into the skin and hair and stimulate hair follicles. When used regularly, you will see great results in the length and health of your beard. Shampoo off with a mild beard shampoo. This simple remedy can also reduce dandruff, tinea and other common beard problems. If you have been wondering whether coconut oil increases facial hair growth in men, the answer is that yes it does, provided you use it diligently. You can check out some easy coconut oil beard recipes on this site. I am sure they will do wonders for your beard and overall sense of well being.